Congress President Rahul Gandhi addresses an election rally at Pakhanjore, in Kanker district. 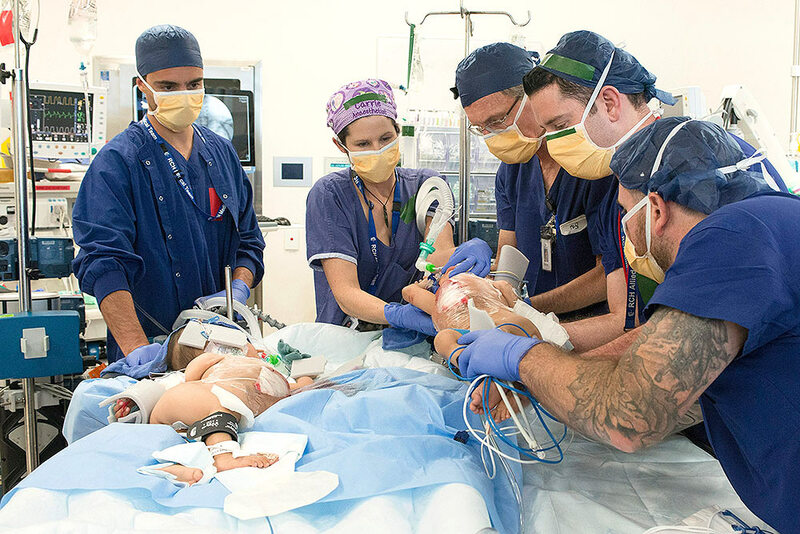 This photo provided by RCH Melbourne Creative Studio, shows surgery on the 15-month-old girls at the Royal Children's Hospital Melbourne, Australia. Surgeons in Australia have begun separating the conjoined twins from Bhutan in a delicate operation expected to last most of the day. 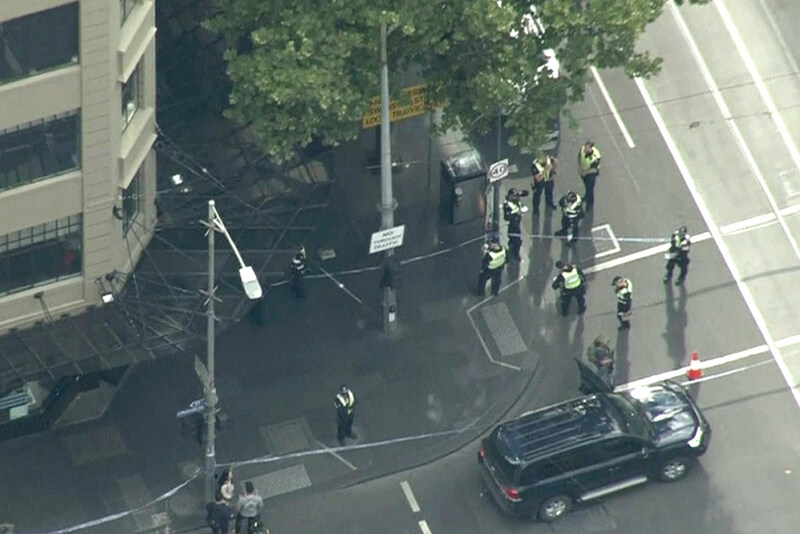 This image made from video shows police on street corner after a shooting in Melbourne, Australia. Police shot a knife-wielding man after he fatally stabbed one person and injured two others in the center of Australia's second-largest city, police said. 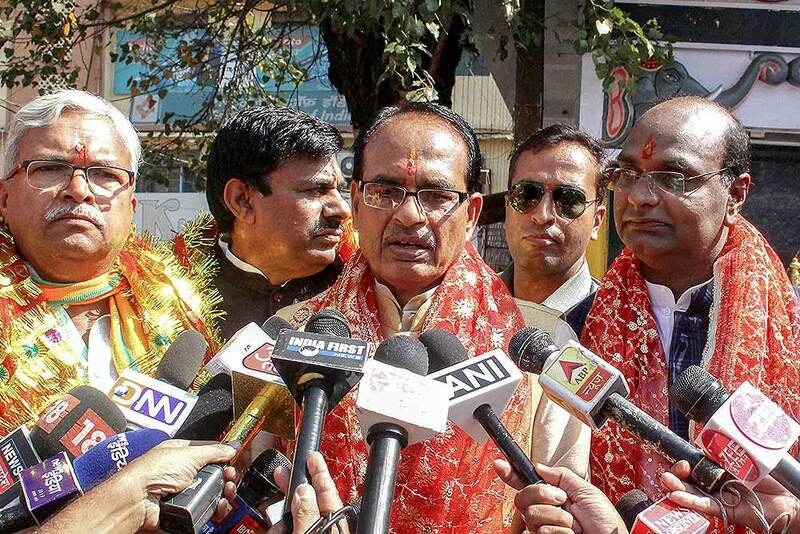 Madhya Pradesh Chief Minister Shivraj Singh Chouhan speaks to the media persons after offering prayer with Bhopal BJP candidates before filing their nomination papers and launch of the election campaign for state assembly elections, in Bhopal. 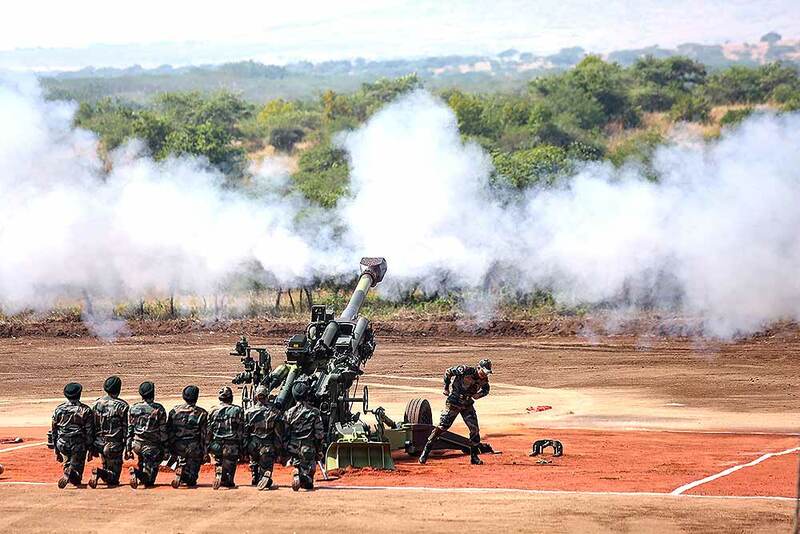 M777 Howitzer gun fires in the air at the formal induction of the major artillery gun systems including the K-9 Vajra, a self-propelled artillery gun and Composite Gun Towing Vehicle during a ceremony at Deolali artillery centre, in Nashik. 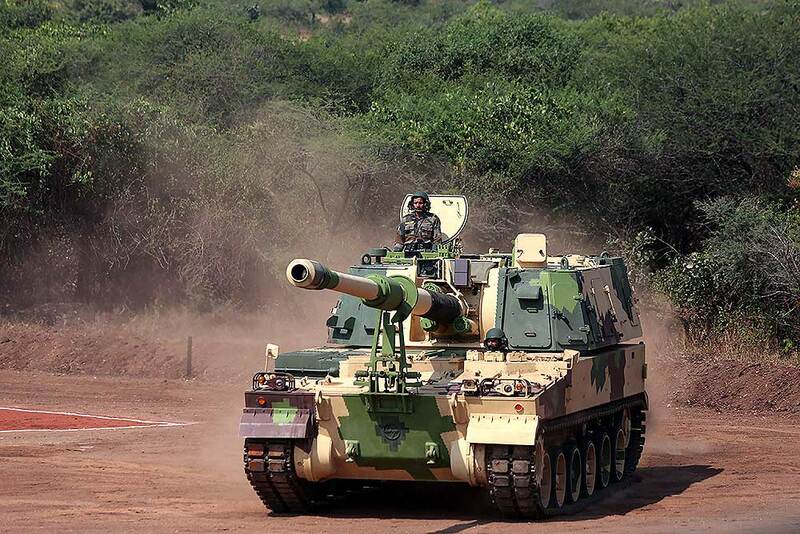 K-9 Vajra, a self-propelled artillery gun, displayed at the formal induction of the major artillery gun systems including the M777 Howitzer guns and Composite Gun Towing Vehicle during a ceremony at Deolali artillery centre, in Nashik district. 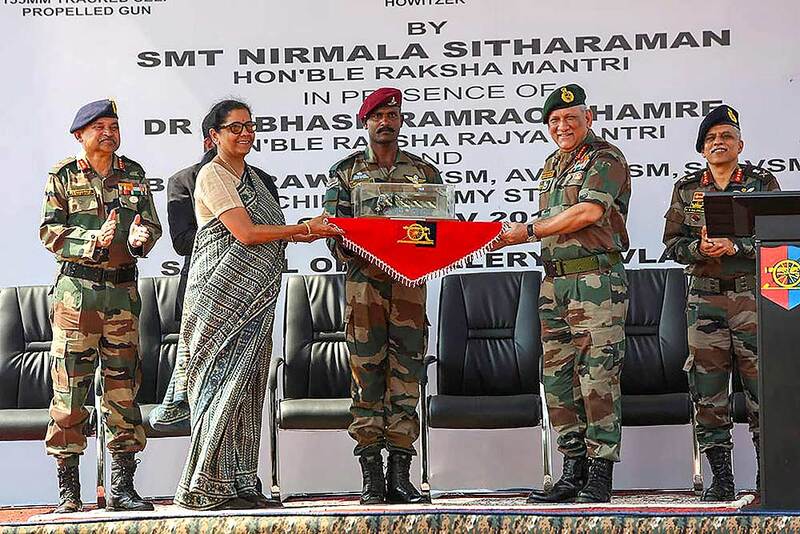 Defence Minister Nirmala Sitharaman and Army Chief General Bipin Rawat attend the formal induction of three major artillery gun systems, including the M777 American Ultra Light Howitzers and the K-9 Vajra, into the Army during a ceremony at Deolali artillery centre, in Nashik district. 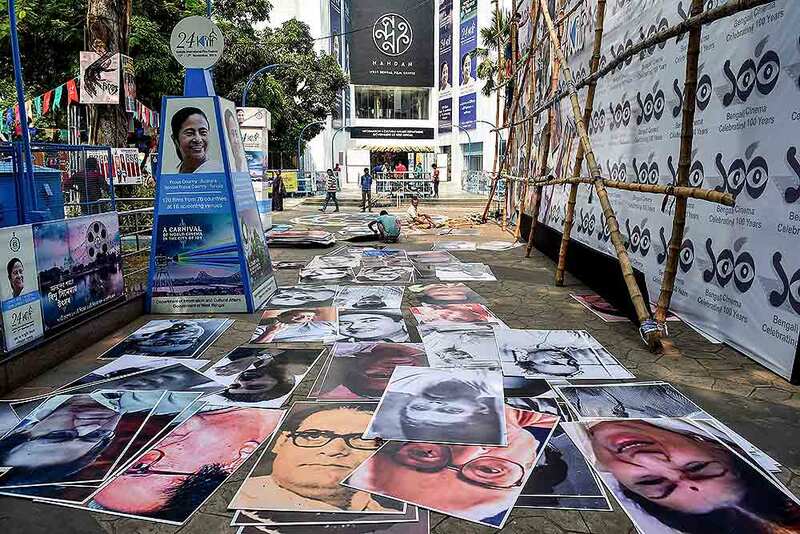 Preparations ahead of 'Kolkata International Film Festival 2018' in Kolkata. 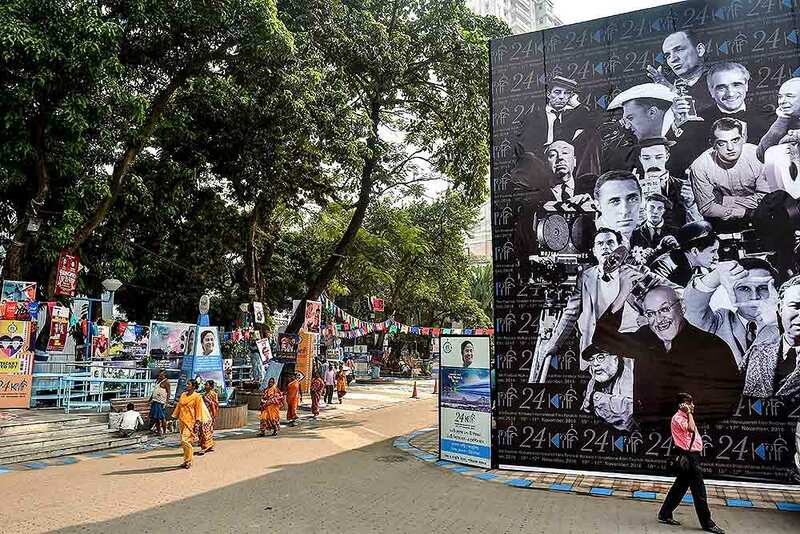 A man walks past a hoarding with photographs of renowned personalities ahead of 'Kolkata International Film Festival 2018' in Kolkata. 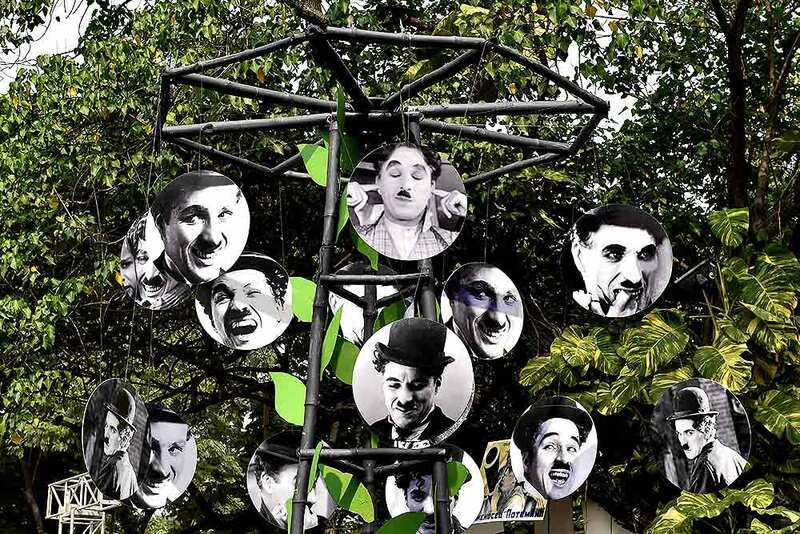 Pictures of world's best-known comedian, Charlie Chaplin, hang from a temporary structure during 'Kolkata International Film Festival 2018' preparations, in Kolkata. 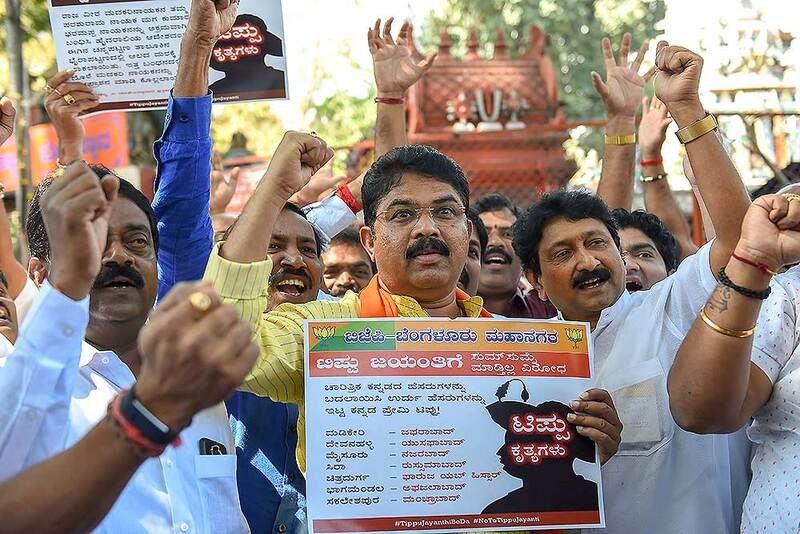 Former Karnataka deputy chief minister R Ashoka and other BJP leaders and workers raise slogans against the State Government as they oppose the celebration of 'Tipu Jayanti', in Bengaluru. 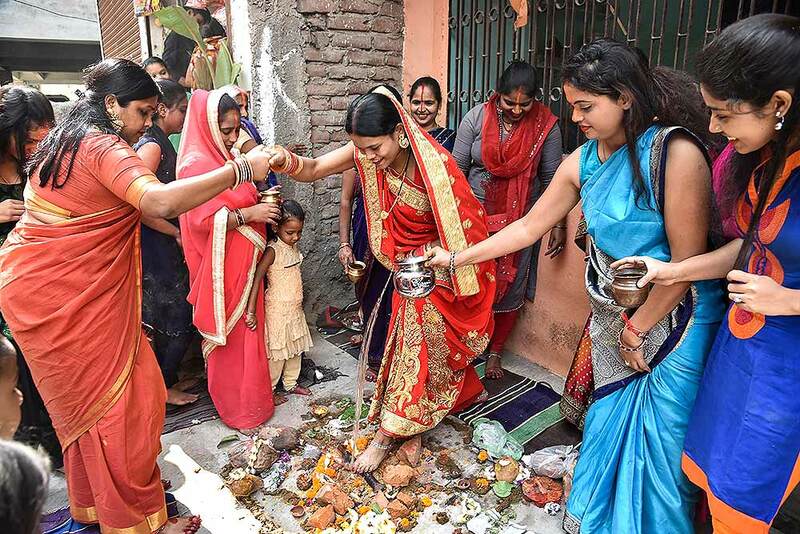 Women perform rituals for their brothers on the occasion of 'Bhai Dooj' Puja, in Patna. Children of an orphanage perform rituals on the occasion of 'Bhai Dooj' festival, in Jammu. 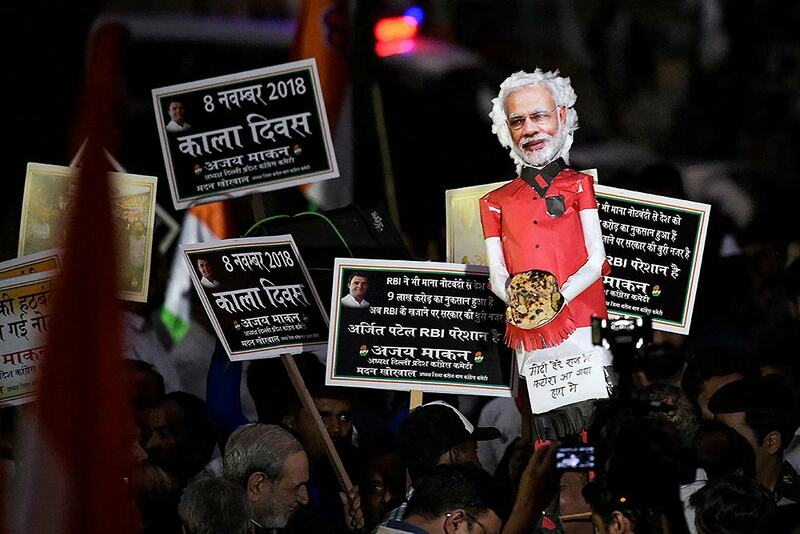 Congress party workers hold placards during a protest against the Central Government on the second anniversary of demonetisation at CSTM, in Mumbai. 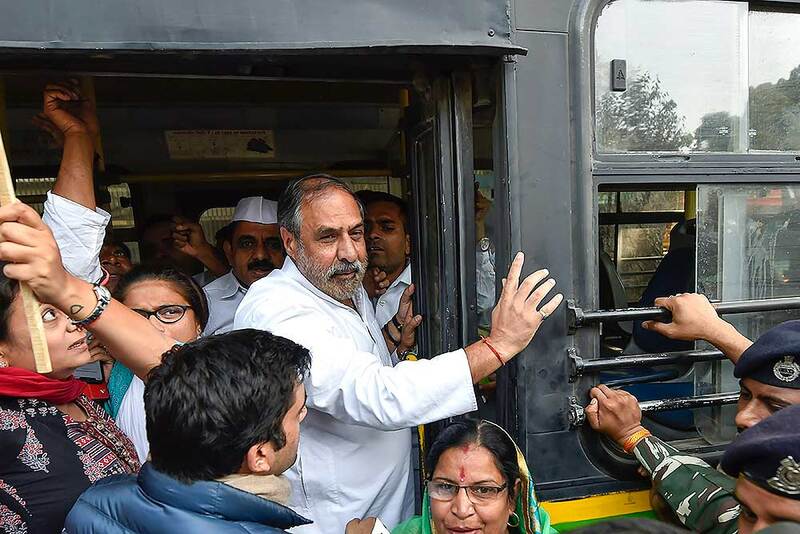 Congress senior leader Anand Sharma during a protest march on the 2nd anniversary of demonetisation outside RBI Headquarters, in New Delhi. 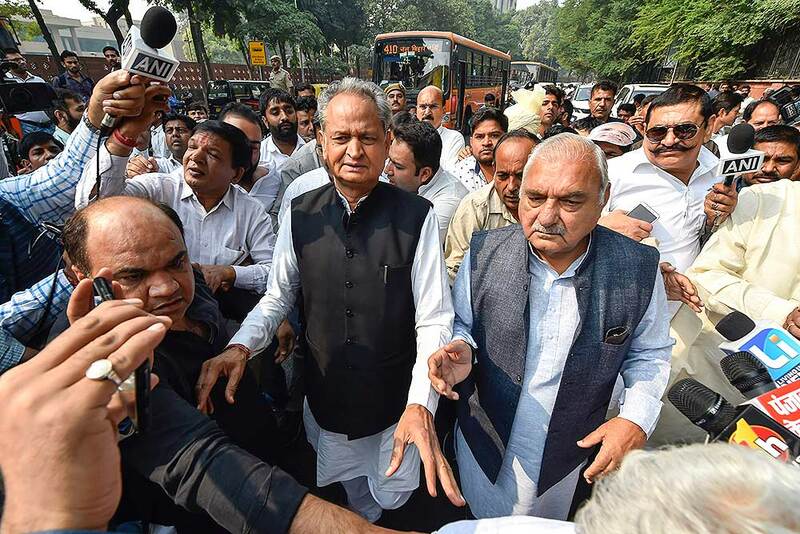 Congress leaders Ashok Gehlot and Bhupinder Singh Hooda during a protest march on the 2nd anniversary of demonetisation outside RBI Headquarters, in New Delhi. 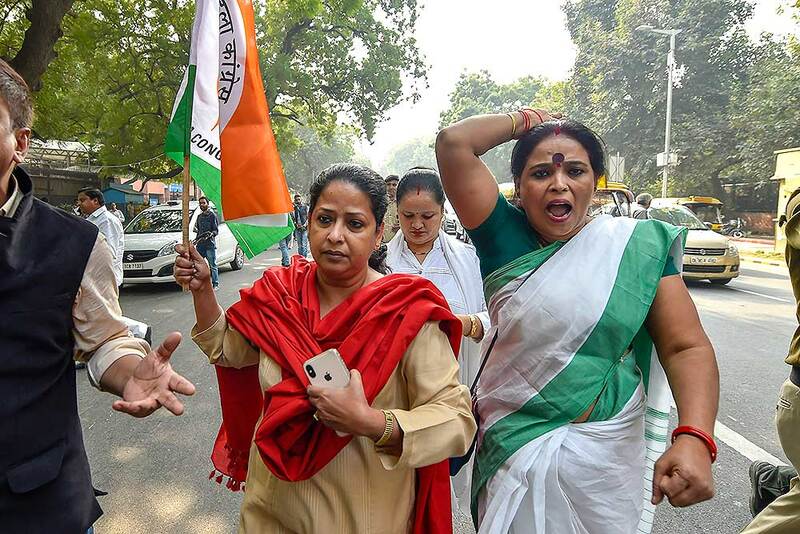 Congress leader Sharmistha Mukherjee and Party worker stage a protest march on the 2nd anniversary of demonetisation outside RBI Headquarters, in New Delhi. 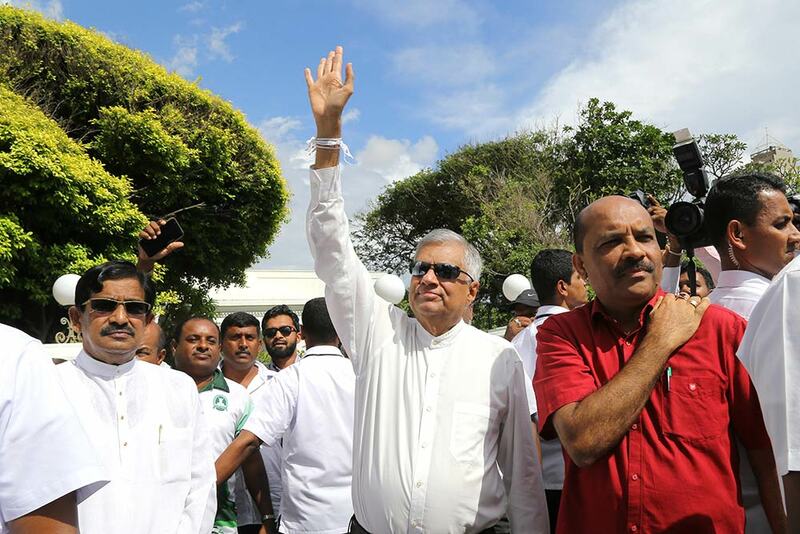 Sri Lanka's ousted prime minister Ranil Wickremesinghe, center, waves as members of his United National Party (UNP) take out a vehicle parade demanding that Parliament be convened in Colombo, Sri Lanka. Sri Lanka has been engulfed in turmoil since President Maithripala Sirisena dismissed Wickremesinghe last month and replaced him with ex-strongman Mahinda Rajapaksa. 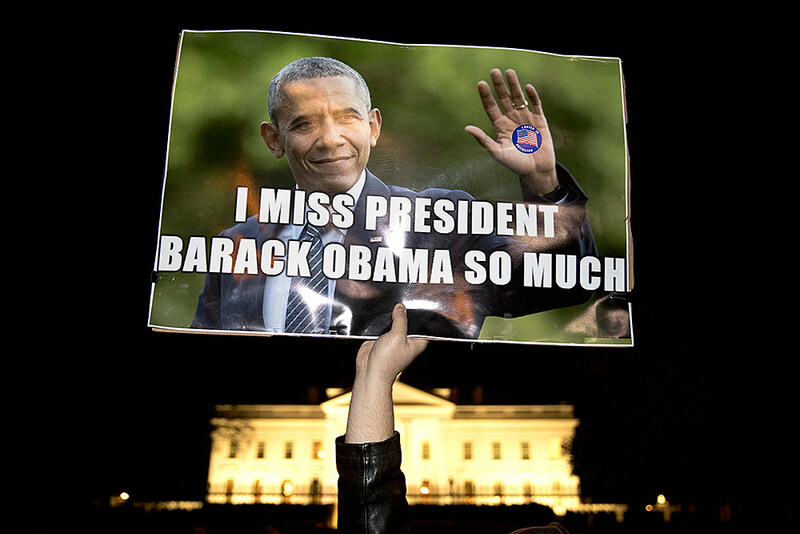 Since his ouster, Wickremesinghe has remained in the prime minister's official residence and insists he is still the legitimate leader. 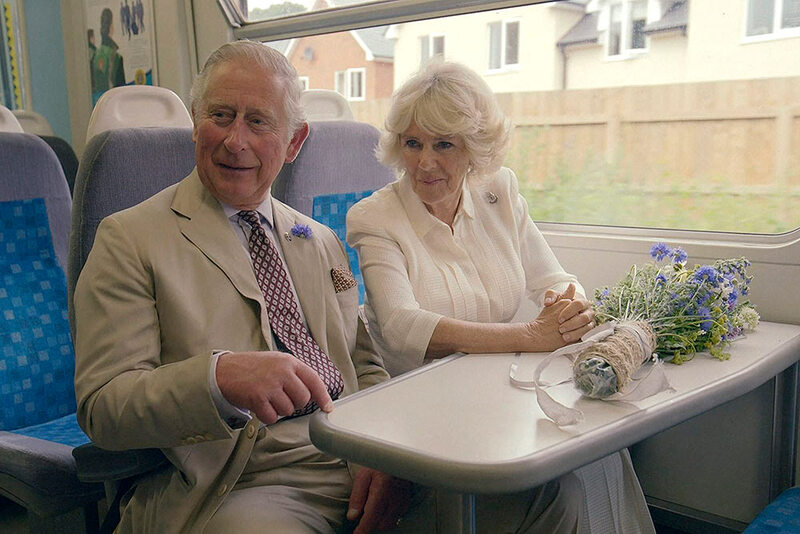 In this grab taken from video provided by the BBC, Britain's Prince Charles and his wife Camilla, the Duchess of Cornwall are interviewed as they travel on a train during a documentary to celebrate his 70th birthday. Prince Charles has pledged not to interfere in the affairs of state when he becomes king, seeking to dispel concerns about his past activism on issues ranging from global warming to architectural preservation. In an interview for a documentary marking his 70th birthday, the heir to the throne told the BBC that he understands he will have to act differently when he becomes king. 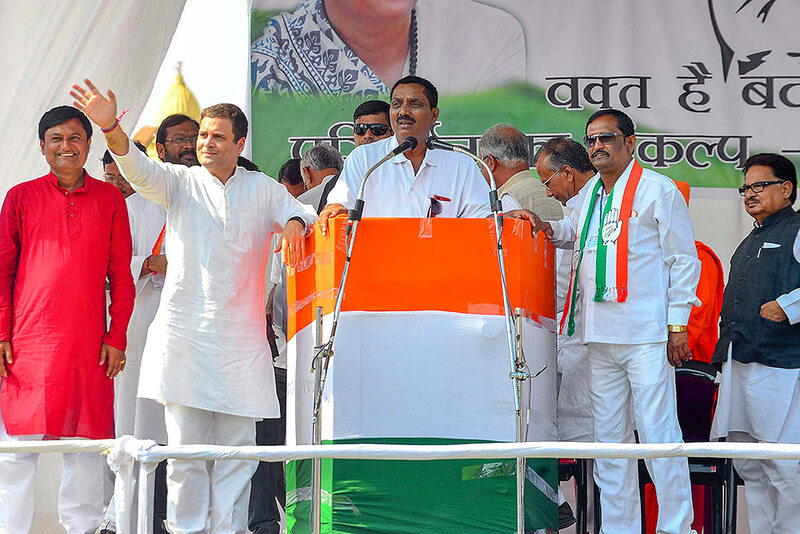 Britain's monarch is barred from interfering in politics. People look at a statue of Israel's Culture and Sports minister Miri Regev in Tel Aviv. 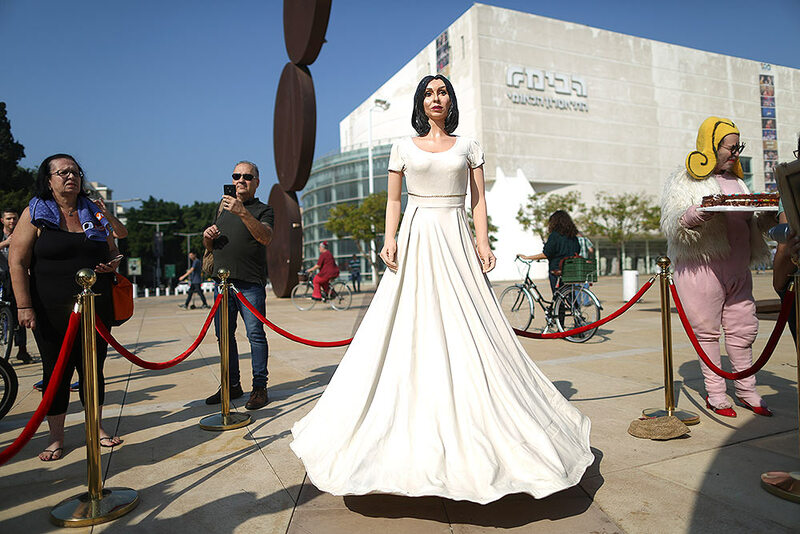 Israeli artist Itay Zalait set up his depiction of Regev as a protest of her pushing for legislation mandating "loyalty" in cultural works. 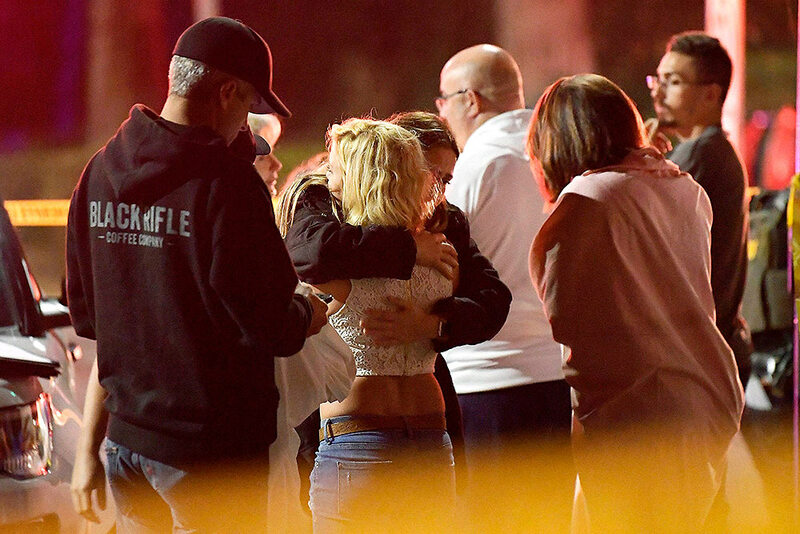 People comfort each other as they stand near the scene in Thousand Oaks, California, where a gunman opened fire Wednesday inside a country dance bar crowded with hundreds of people on "college night," wounding multiple people including a deputy who rushed to the scene. 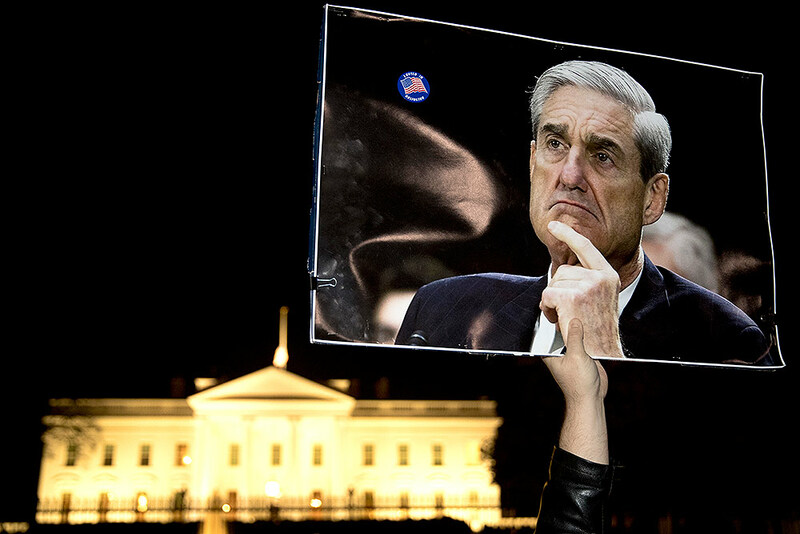 Protesters gather in front of the White House in Washington as part of a nationwide "Protect Mueller" campaign demanding that Acting U.S. Attorney General Matthew Whitaker recuse himself from overseeing the ongoing special counsel investigation. 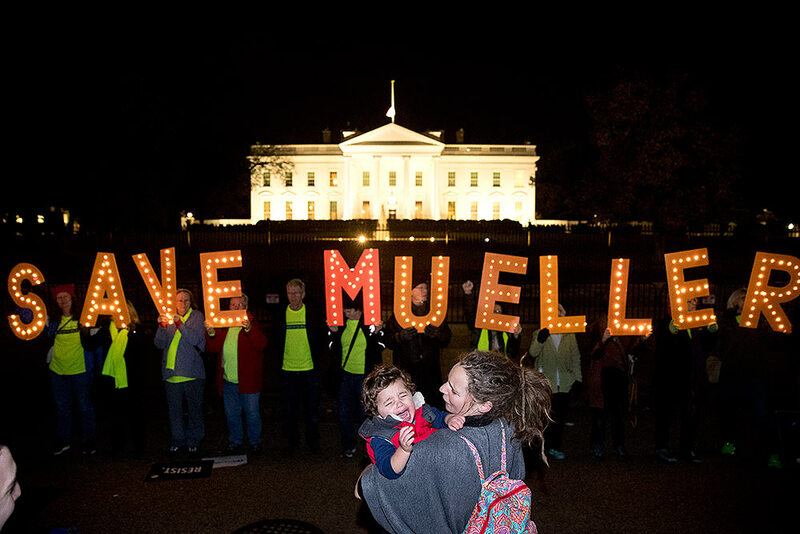 Protesters gather in front of the White House in Washington, as part of a nationwide "Protect Mueller" campaign demanding that Acting U.S. Attorney General Matthew Whitaker recuse himself from overseeing the ongoing special counsel investigation. 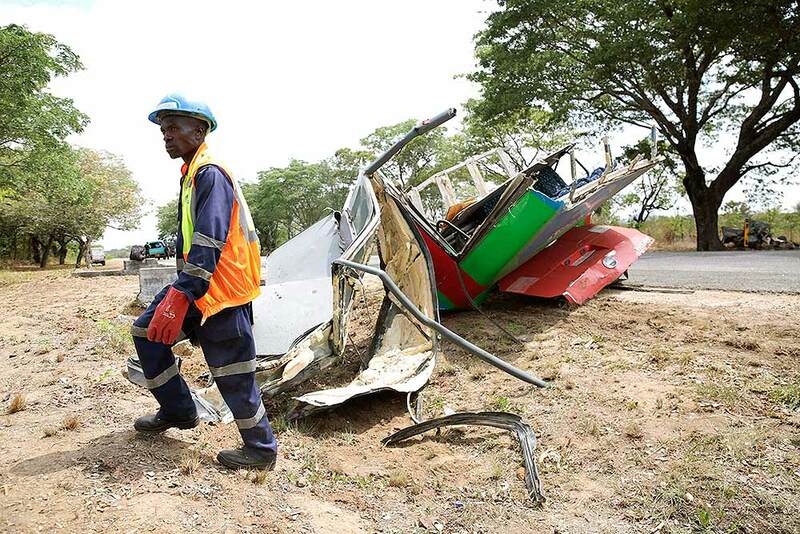 A rescue worker at the scene of a bus crash in Rusape about 170 kilomertes east of the capital Harare. A head-on collision between two buses has killed 47 people, where road accidents are common due to poor roads and bad driving. 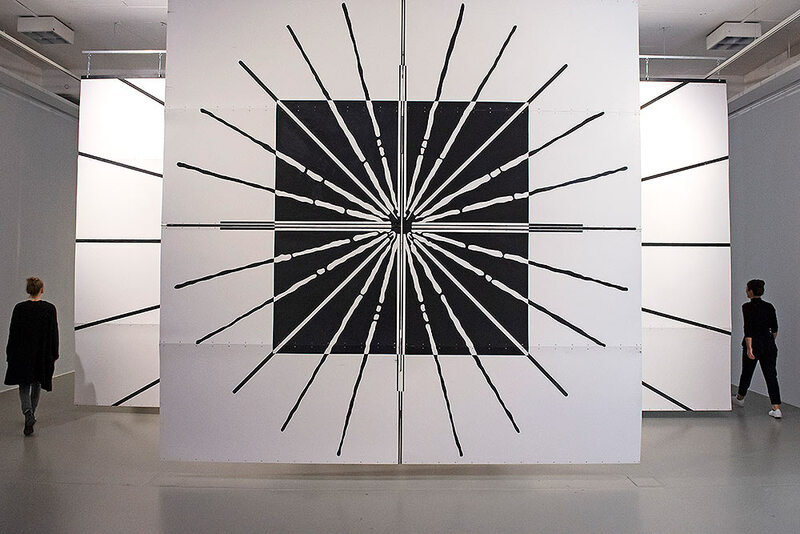 Visitors walk besides the work 'White Sun/Black Square' (1988) by Belgian artist Anne-Mie van Kerckhoven during the press preview for the exhibition 'AMVK' in the Fridericianum in Kassel, Germany. 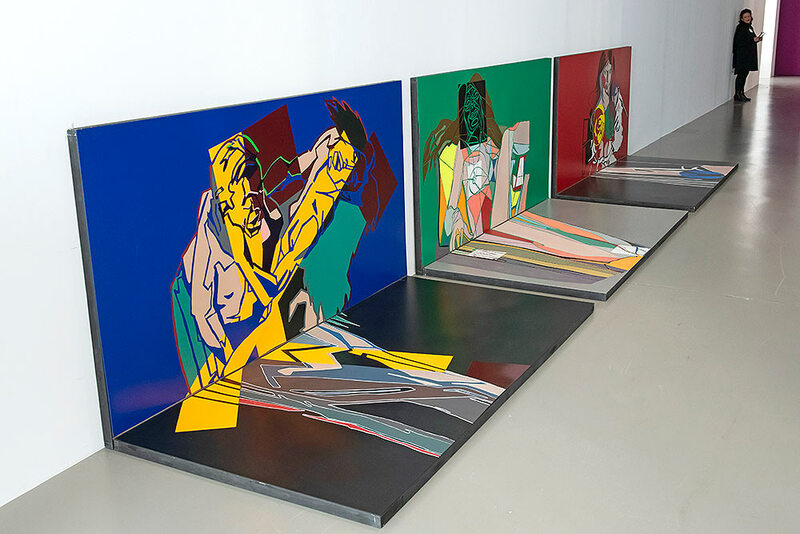 Visitors stands besides the work '3 Altare' (1989) by Belgian artist Anne-Mie van Kerckhoven during the press preview for the exhibition 'AMVK' in the Fridericianum in Kassel, Germany. 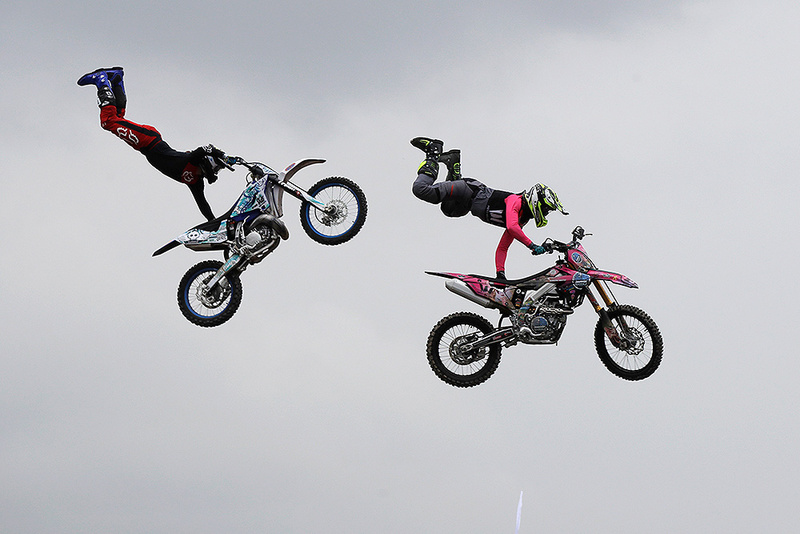 Riders perform during a freestyle motocross show at the EICMA exhibition motorcycle fair in Milan, Italy. 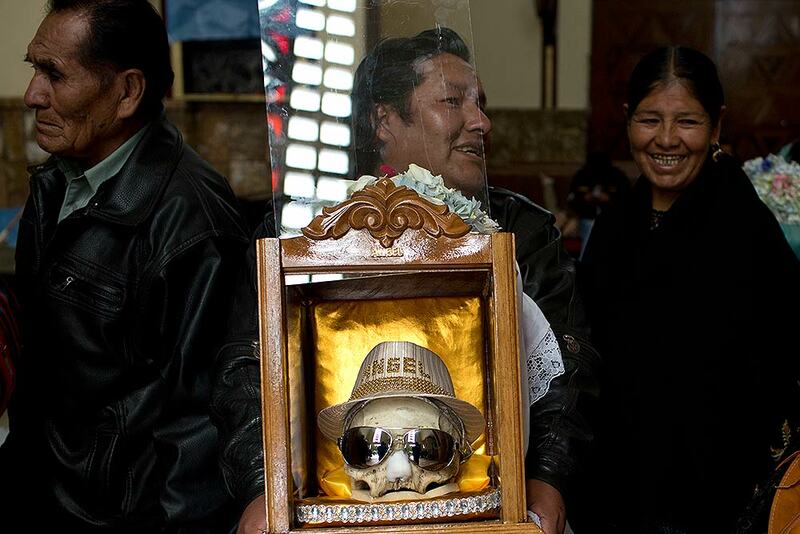 A man carries a decorated human skull after praying at the General Cemetery chapel during the Natitas Festival in La Paz, Bolivia. 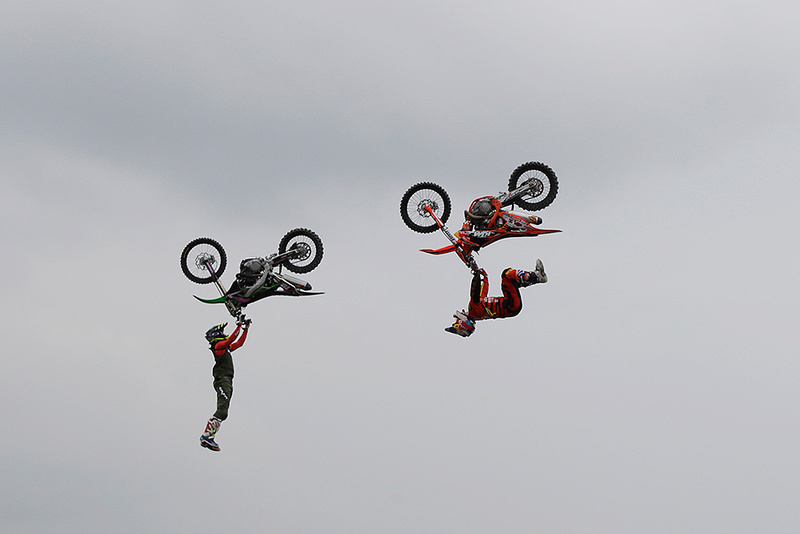 The festival is a mix of Andean ancestral worship and Roman Catholic beliefs. Experts say it was common in pre-Columbian times to keep skulls as trophies and display them to symbolize death and rebirth. 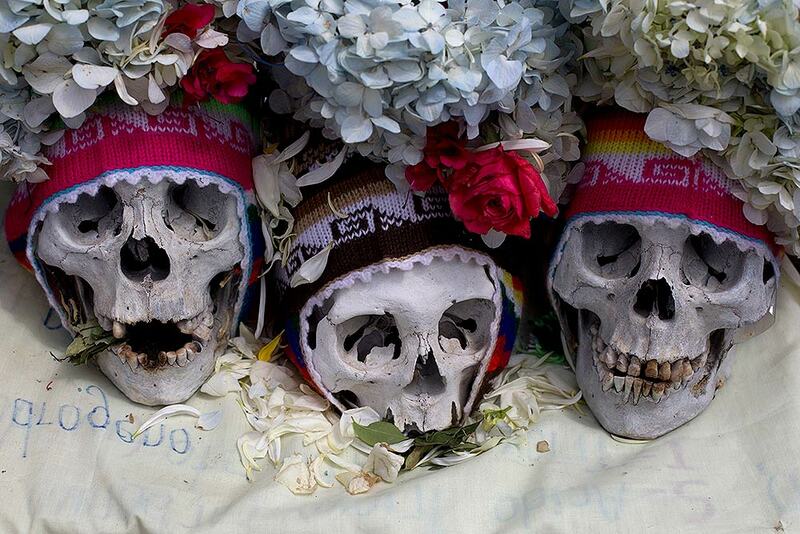 Decorated humans skulls are displayed at the General Cemetery marking the annual Natitas Festival in La Paz, Bolivia. Actress Alison Sudol poses at the world premiere of the film "Fantastic Beasts: The Crimes of Grindelwald" in Paris. 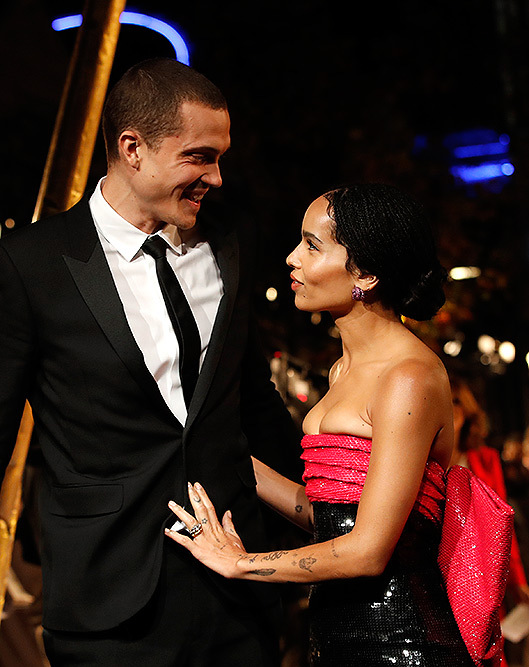 Actress Zoe Kravitz and her partner, Karl Glusman, pose at the world premiere of the film "Fantastic Beasts: The Crimes of Grindelwald" in Paris. 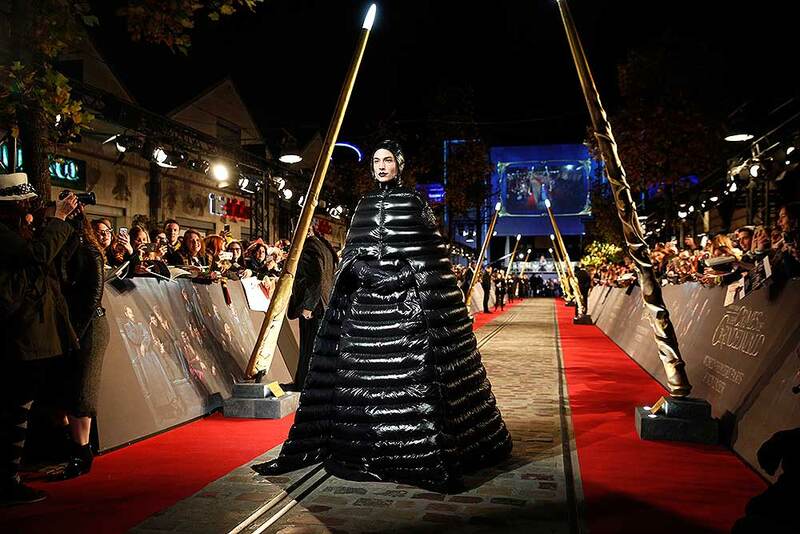 Actor Ezra Miller poses at the world premiere of the film "Fantastic Beasts: The Crimes of Grindelwald" in Paris. 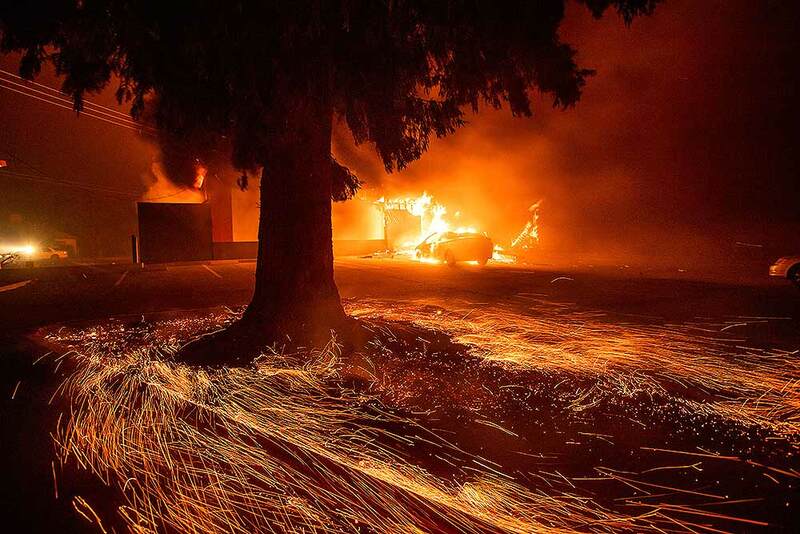 Flames consume a Kentucky Fried Chicken as the Camp Fire tears through Paradise, California. Tens of thousands of people fled a fast-moving wildfire Thursday in Northern California, some clutching babies and pets as they abandoned vehicles and struck out on foot ahead of the flames that forced the evacuation of an entire town and destroyed hundreds of structures. 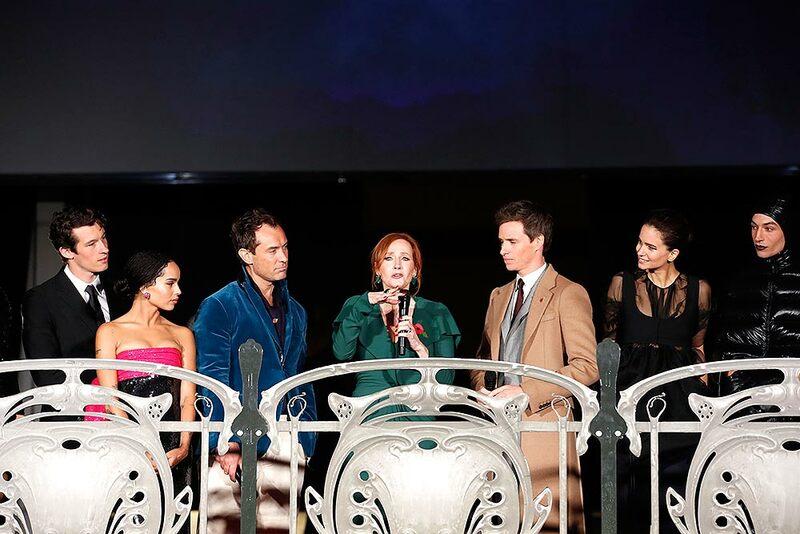 From left Callum Turner, Zoe Kravitz, Jude Law, J.K Rowling, Eddie Redmayne, Katherine Waterston and Ezra Miller pose at the world premiere of the film "Fantastic Beasts: The Crimes of Grindelwald" in Paris. 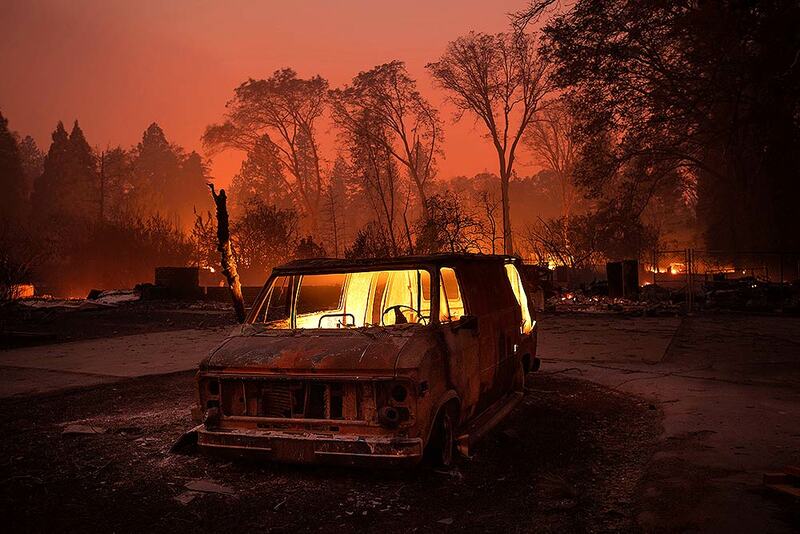 Flames burn inside a van as the Camp Fire tears through Paradise, California. 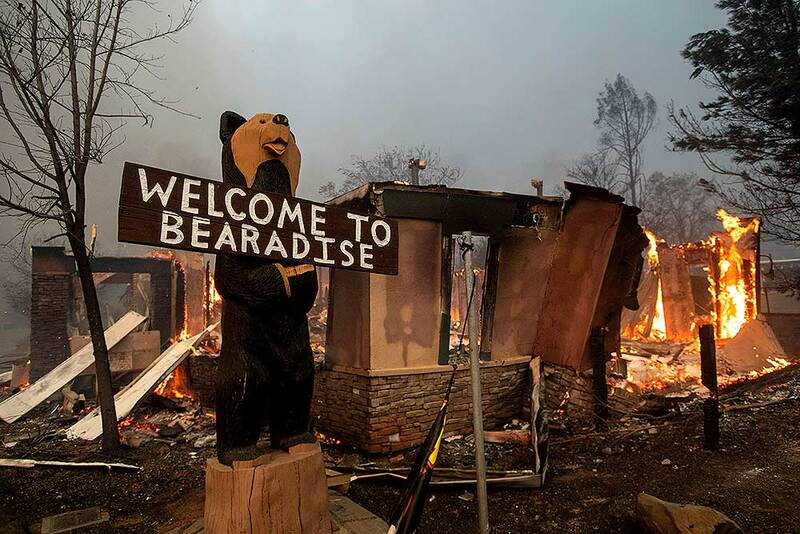 The Camp Fire rages through Paradise, California. 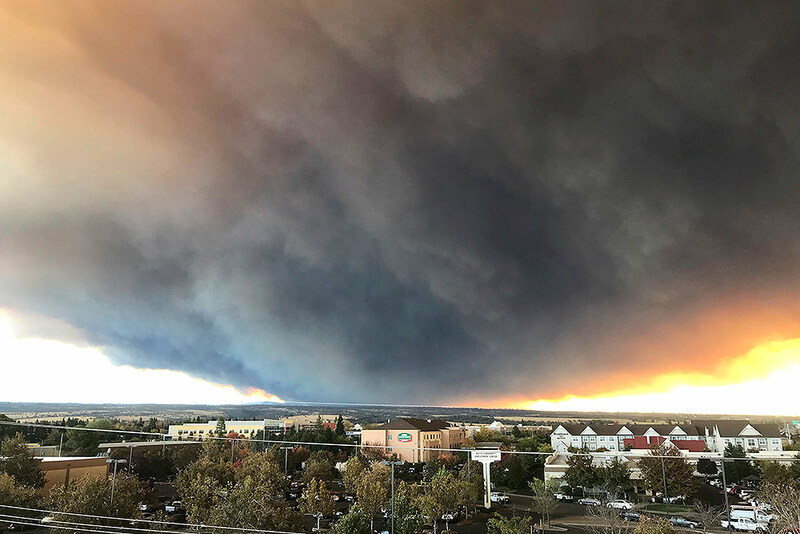 Tens of thousands of people fled a fast-moving wildfire in Northern California, some clutching babies and pets as they abandoned vehicles and struck out on foot ahead of the flames that forced the evacuation of an entire town. 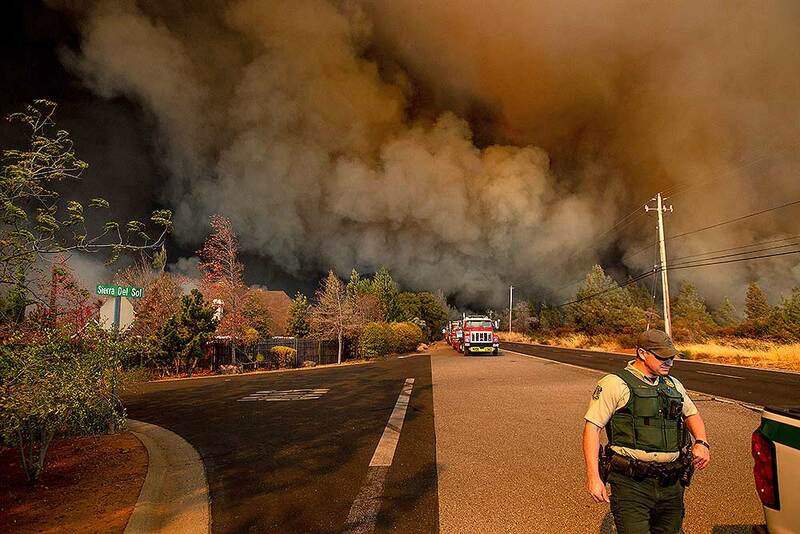 A home burns as the Camp Fire rages through Paradise, California. 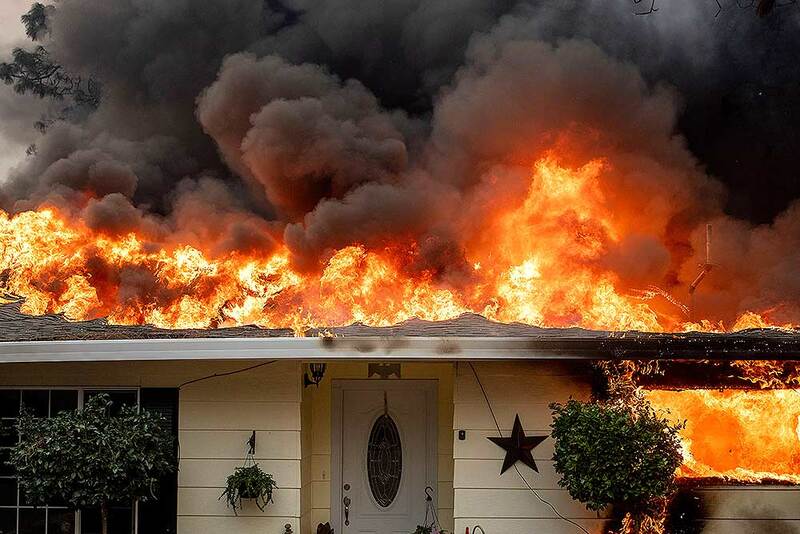 Flames consume a home as the Camp Fire tears through Paradise, California. A California fire official says a fast-moving wildfire in Northern California has destroyed structures and injured civilians. 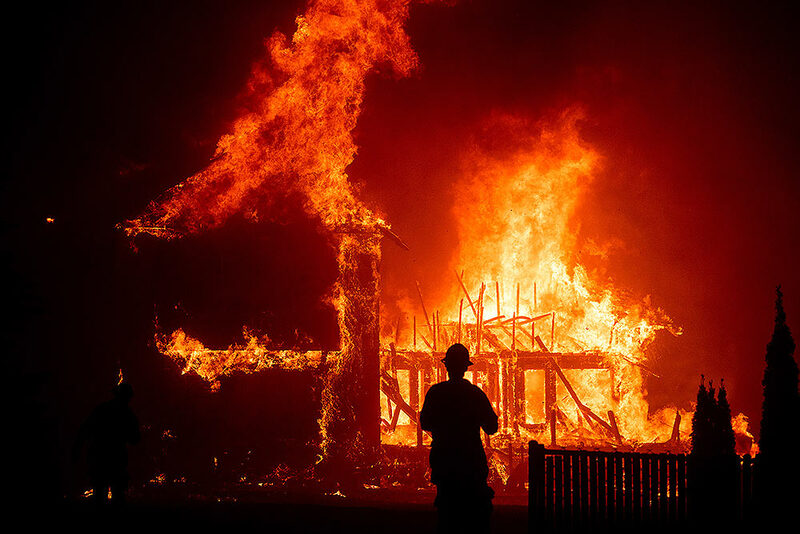 Flames consume a building as the Camp Fire tears through Paradise, California. 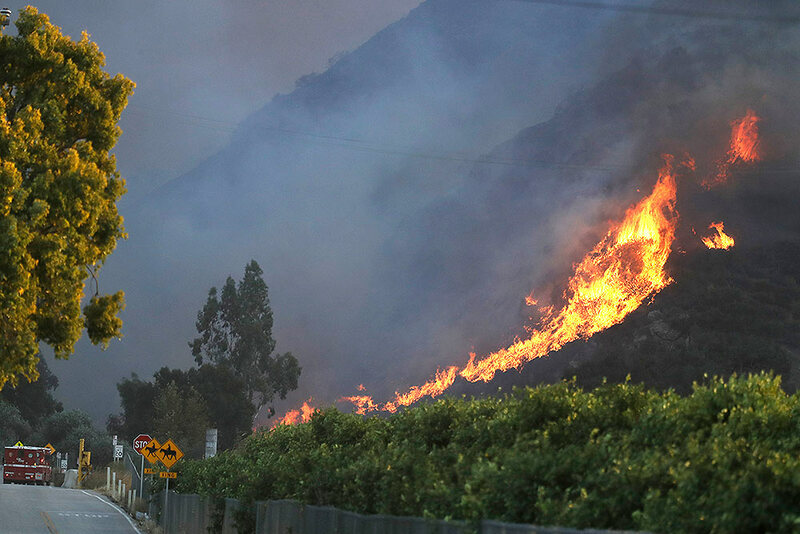 A wildfire comes down from a hilltop near Newbury Park, California. The Ventura County Fire Department has ordered evacuation of some communities in the path of the fire, which erupted a few miles from the site of Wednesday night's deadly mass shooting at a Thousand Oaks bar. 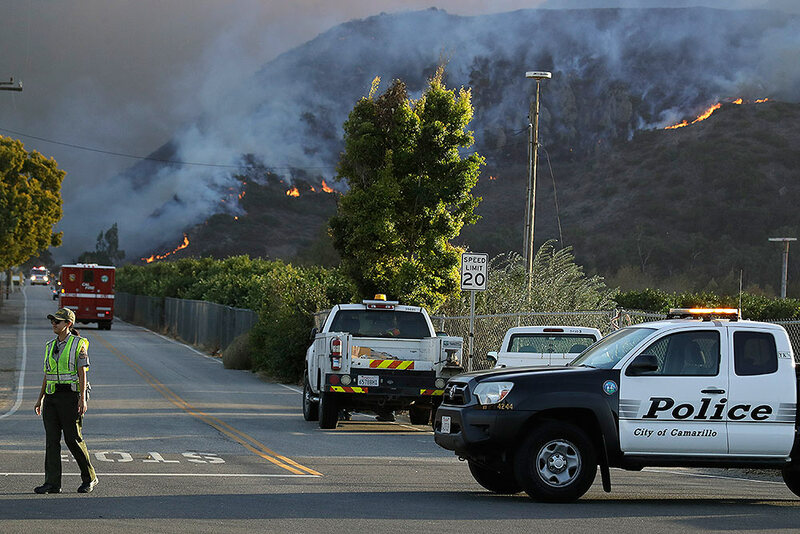 A police officer mans a checkpoint in front of an advancing wildfire near Newbury Park, California. 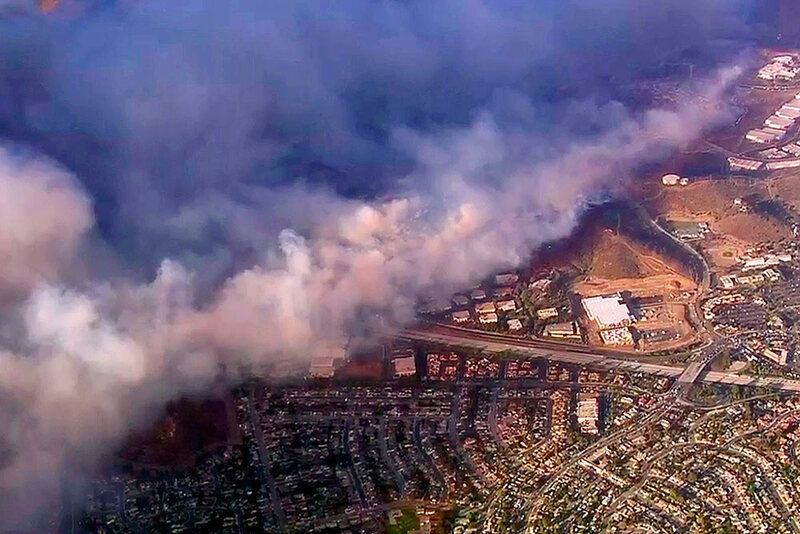 This photo taken from video provided by CBS2/KCAL9 shows a wildfire burning in Camarillo, California. Known as the Hill fire, it here has crossed U.S. Highway 101, at center right, potentially threatening hundreds of homes. 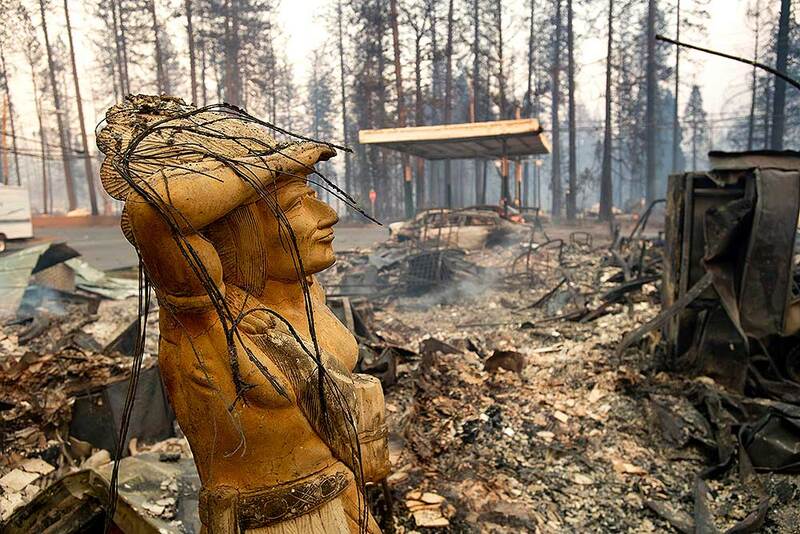 A statue rests amid a charred lot as the Camp Fire tears through Paradise, California. 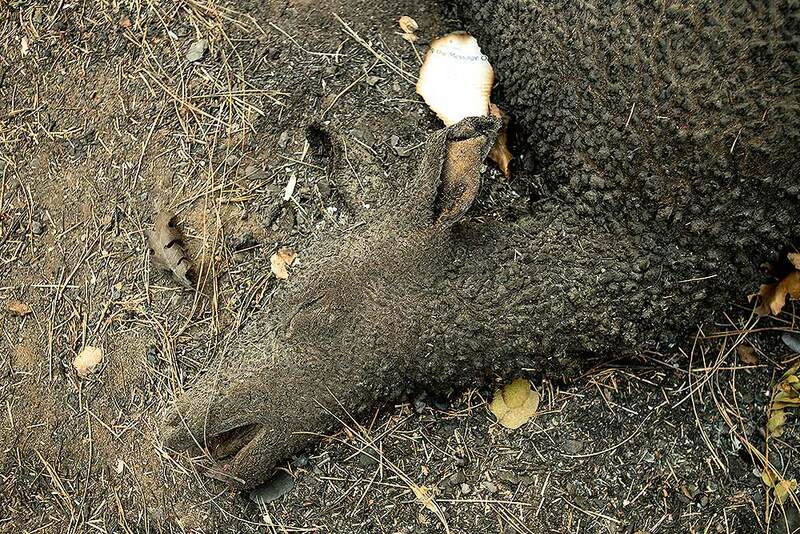 A charred animal rests on a roadside as the Camp Fire tears through Paradise, California. 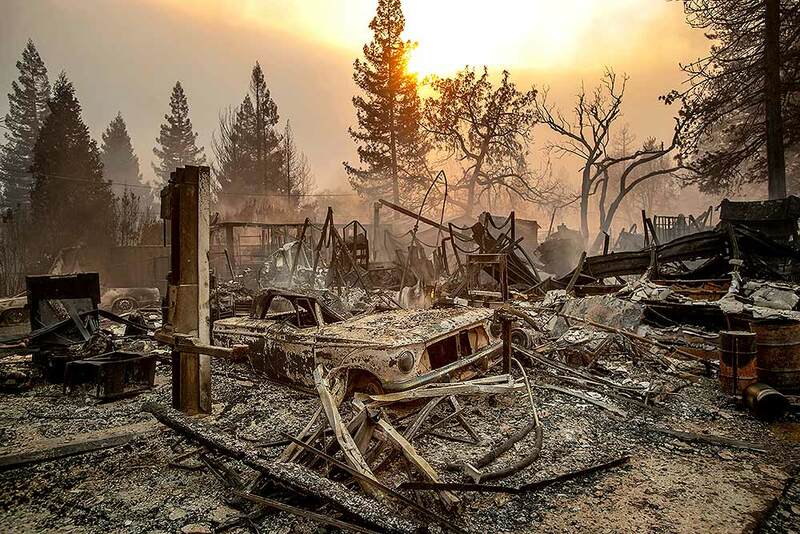 A vintage car rests among debris as the Camp Fire tears through Paradise, California. The massive plume from the Camp Fire, burning in the Feather River Canyon near Paradise, California. 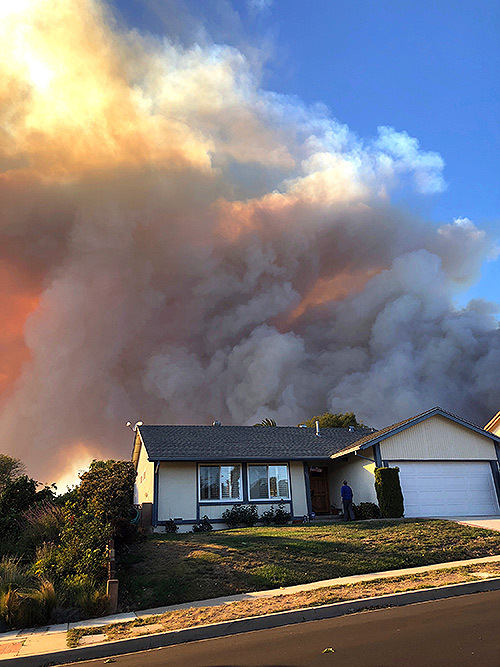 Authorities in Northern California have ordered mandatory evacuations in a rural area where the wildfire has grown to 1,000 acres (405 hectares) amid hot and windy weather. 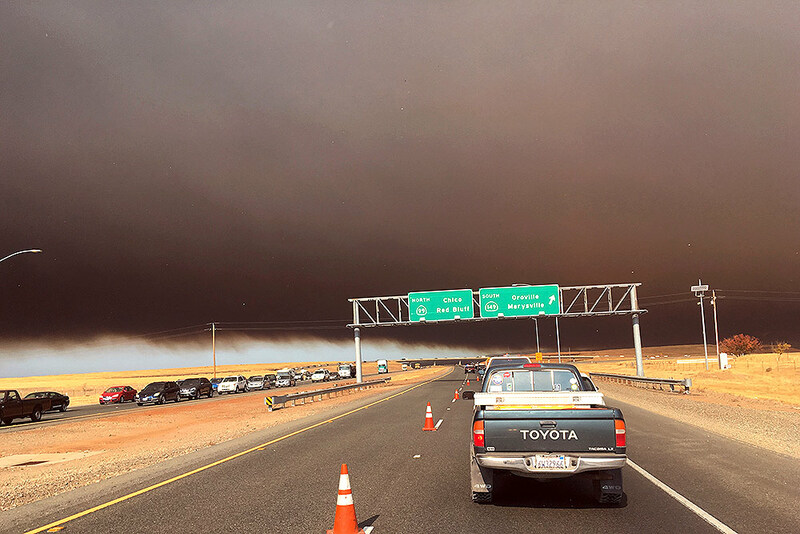 Smoke from the Camp Fire, burning in the Feather River Canyon near Paradise, California, darkens the sky as seen from Highway 99 near Marysville. Plumes of smoke loom in the sky several miles away, seen behind a home in Thousand Oaks, California, as a wind-driven wildfire known as the Hill fire threatens the area. 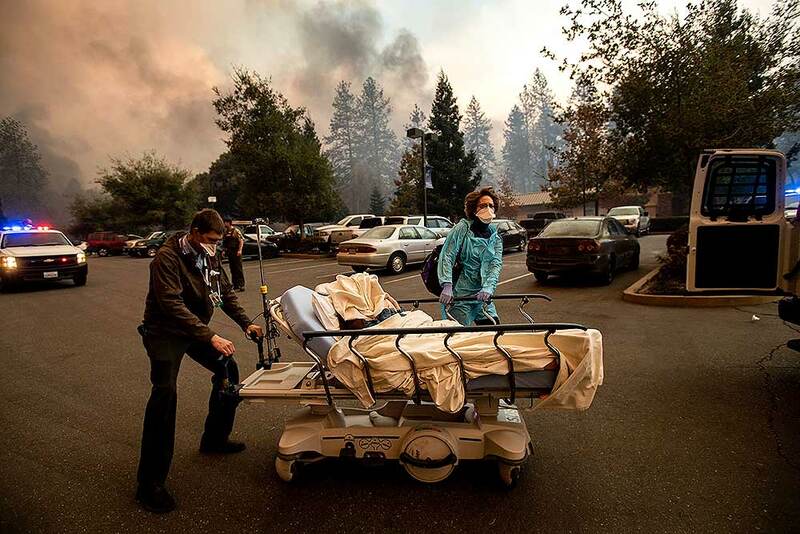 Medical personnel evacuate patients as the Feather River Hospital burns while the Camp Fire rages through Paradise, California. 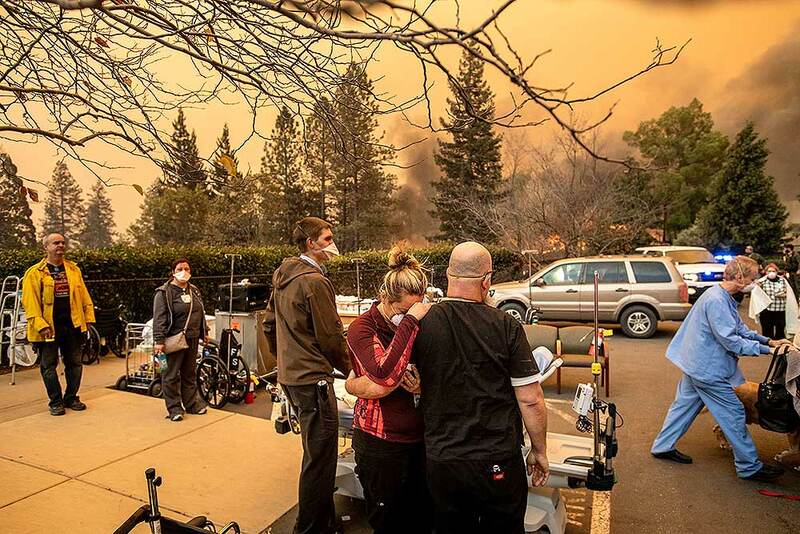 Nurse Cassie Lerossignol hugs as coworker as the Feather River Hospital burns while the Camp Fire rages through Paradise, California. 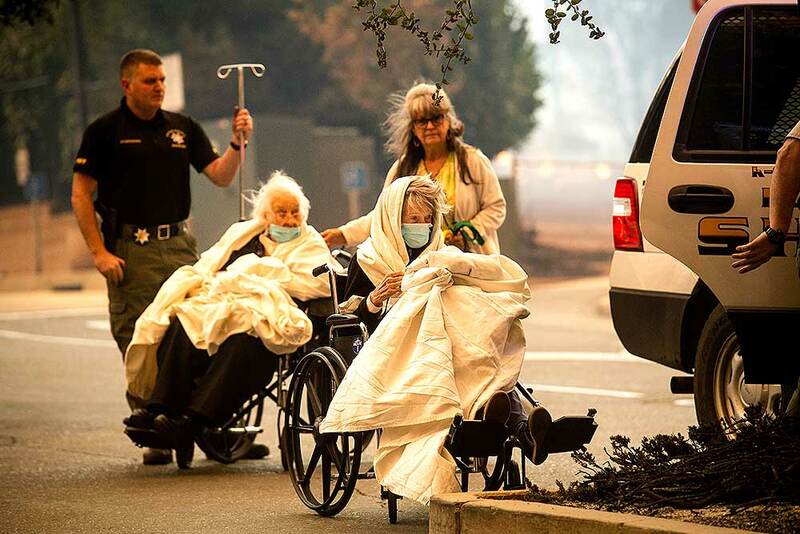 Emergency personnel evacuate patients as the Feather River Hospital burns while the Camp Fire rages through Paradise, California. 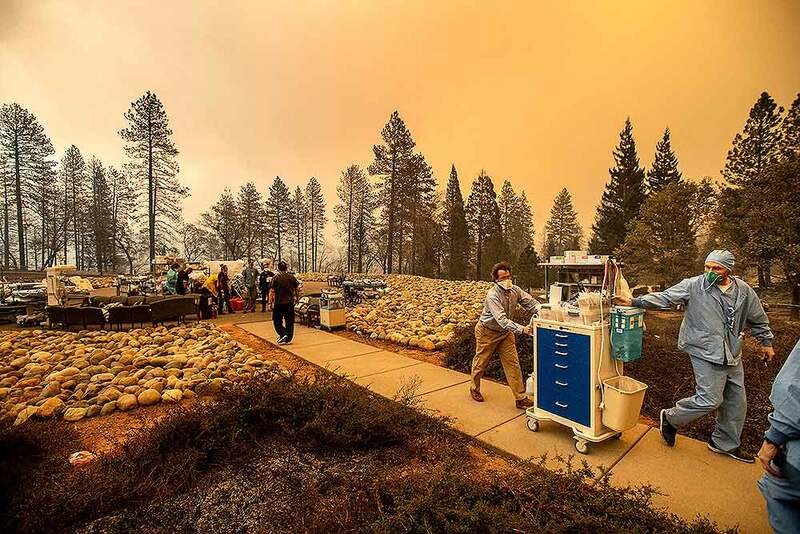 Medical workers move equipment from a makeshift emergency room while the Feather River Hospital burns as the Camp Fire rages through Paradise, California. 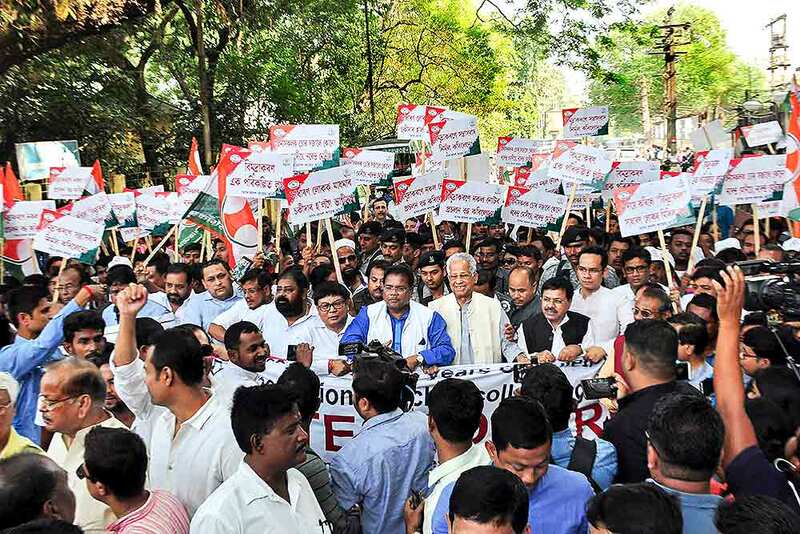 Former Assam Chief Minister Tarun Gogoi, Assam Pradesh Congress Committee President Ripun Bora, MP Gaurav Gogoi and others take part in a protest rally on the second anniversary of demonetisation, in Guwahati. Lady Gaga arrives at the Patron of the Artists Awards at the Wallis Annenberg Center for the Performing Arts in Beverly Hills, California. Britain's Prince William and Kate, Duchess of Cambridge attend the Tusk Conservation Awards at Banqueting House in London. Barbara Palvin, from left, Yasmin Wijnaldum, Winnie Harlow, Gigi Hadid, Kendall Jenner and Alexina Graham walks the runway during the 2018 Victoria's Secret Fashion Show at Pier 94 in New York. Model Kendall Jenner walks the runway during the 2018 Victoria's Secret Fashion Show at Pier 94 in New York. Model Devon Windsor, center, walks the runway during the 2018 Victoria's Secret Fashion Show at Pier 94 in New York. Model Gigi Hadid walks the runway during the 2018 Victoria's Secret Fashion Show at Pier 94 in New York. Model Candice Swanepoel, left, and singer Kelsea Ballerini walks the runway during the 2018 Victoria's Secret Fashion Show at Pier 94 in New York. Bebe Rexha performs during the 2018 Victoria's Secret Fashion Show at Pier 94 in New York. Gigi Hadid walks the runway during the 2018 Victoria's Secret Fashion Show at Pier 94 in New York. Cindy Bruna walks the runway during the 2018 Victoria's Secret Fashion Show at Pier 94 in New York. Adriana Lima waves to the audience as she walks the runway during the 2018 Victoria's Secret Fashion Show at Pier 94 in New York. Model Bella Hadid, left, walks the runway as singer Halsey performs during the 2018 Victoria's Secret Fashion Show at Pier 94 in New York. Candice Swanepoel walks the runway during the 2018 Victoria's Secret Fashion Show at Pier 94 in New York. Singer Luke Spiller, left, and model Adriana Lima on the runway during the 2018 Victoria's Secret Fashion Show at Pier 94 in New York. Model Josephine Skriver walks the runway as singer Shawn Mendes performs during the 2018 Victoria's Secret Fashion Show at Pier 94 in New York. Singers Kelsea Ballerini, left, and Andrew Taggart perform during the 2018 Victoria's Secret Fashion Show at Pier 94 in New York. Model Bella Hadid walks the runway during the 2018 Victoria's Secret Fashion Show at Pier 94 in New York. 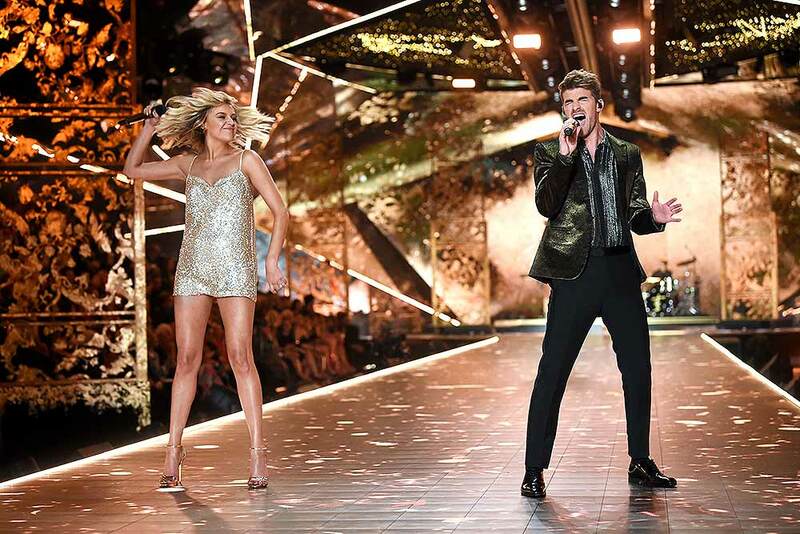 Alex Pall, left, and Andrew Taggart, right, of The Chainsmokers, and Kelsea Ballerini perform during the 2018 Victoria's Secret Fashion Show at Pier 94 in New York. Rita Ora performs during the 2018 Victoria's Secret Fashion Show at Pier 94 in New York. 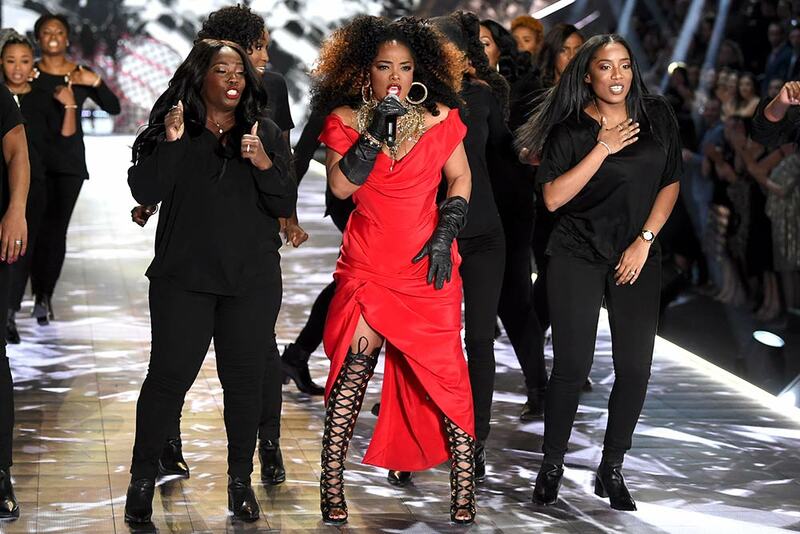 Leela James, center, performs during the 2018 Victoria's Secret Fashion Show at Pier 94 in New York. Rita Ora, center, Andrew Taggart, from center right, Kelsea Ballerini, Halsey and Alex Pall pose with models at the end of the 2018 Victoria's Secret Fashion Show at Pier 94 in New York. 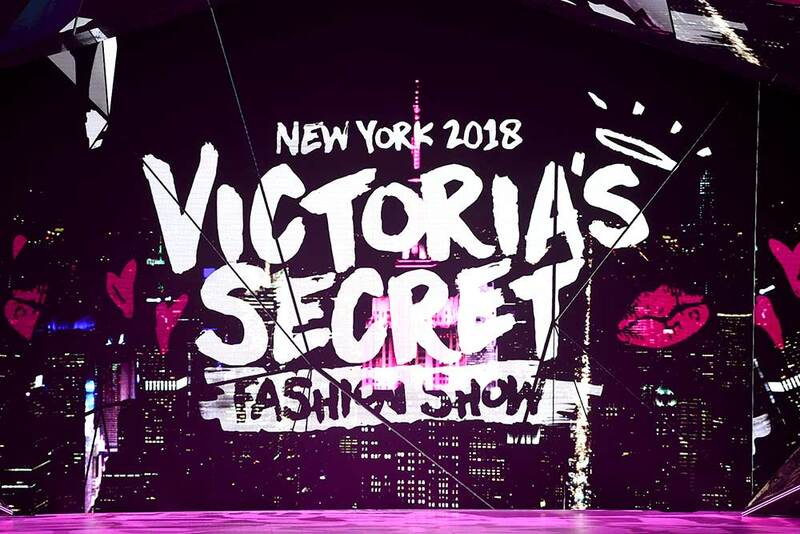 A view of the runway appears during the 2018 Victoria's Secret Fashion Show at Pier 94 in New York. Shanina Shaik attends the 2018 Victoria's Secret Fashion Show after-party at Pier 94 in New York. Gigi Hadid attends the 2018 Victoria's Secret Fashion Show after-party at Pier 94 in New York. Bella Hadid attends the 2018 Victoria's Secret Fashion Show after-party at Pier 94 in New York. Alex DeLeon and Josephine Skriver attend the 2018 Victoria's Secret Fashion Show after-party at Pier 94 in New York. 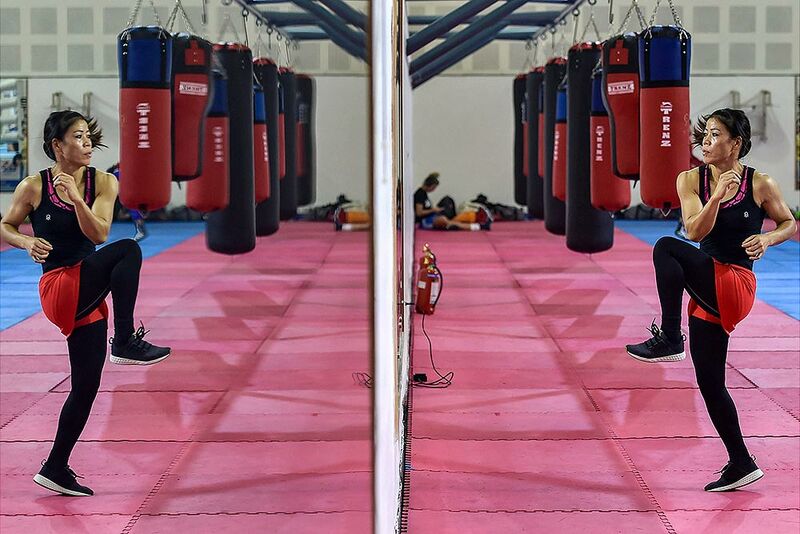 Boxer MC Mary Kom during a practice session ahead of the 'AIBA Women's World Boxing Championships 2018' at IG Stadium in New Delhi. 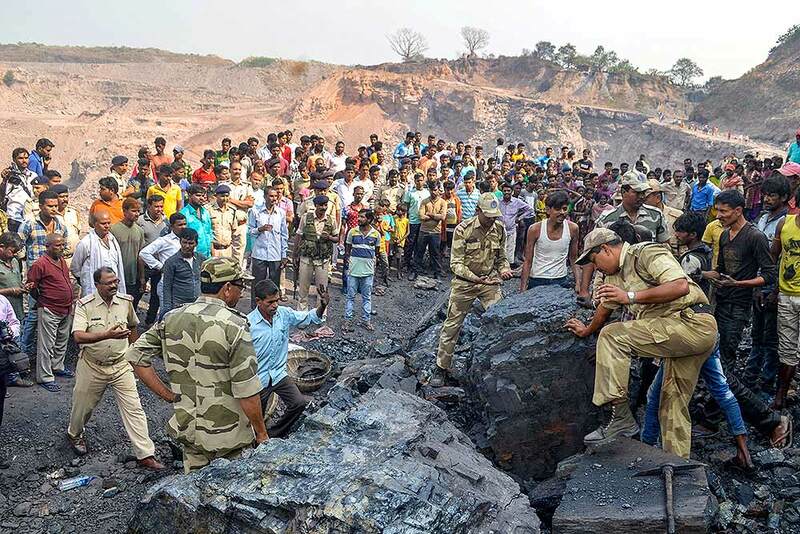 Police officials investigate the site where three people were killed in a mishap due to illegal coal mining at China Croak South Mines, Jharia, in Dhanbad. 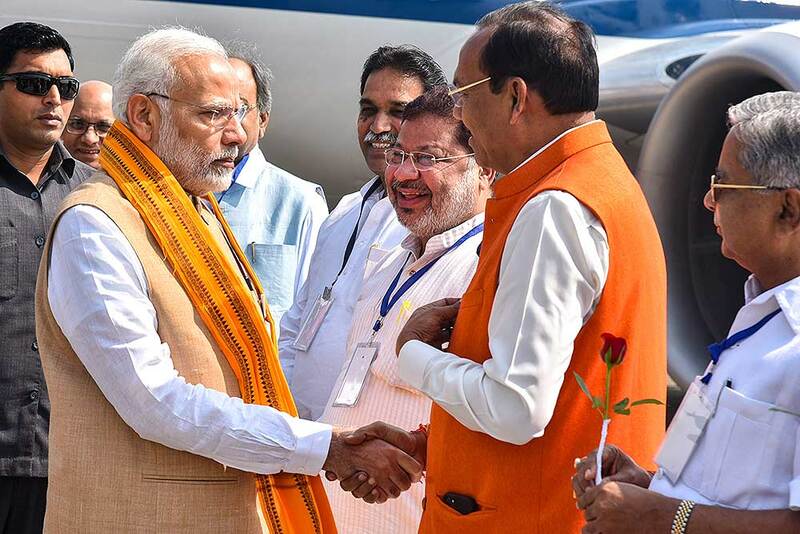 Prime Minister Narendra Modi is welcomed by the BJP leaders as he arrives at the Airport to attend an election rally at Jagdalpur, in Raipur. 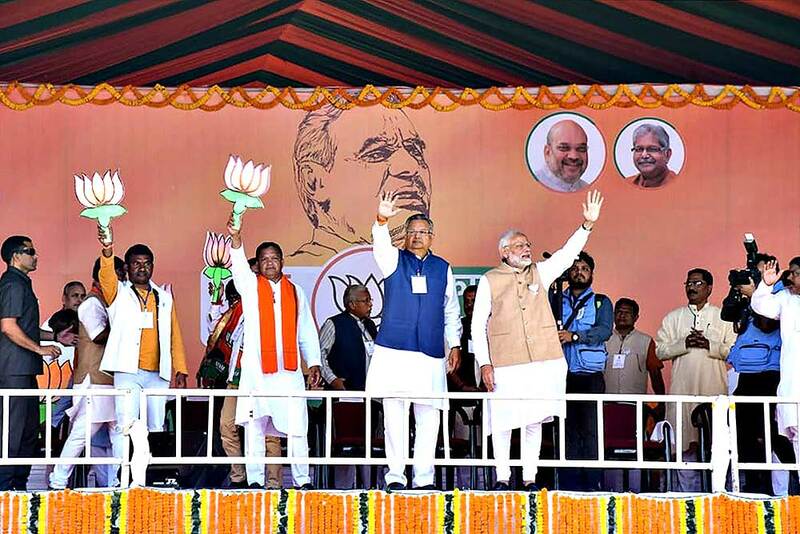 Prime Minister Narendra Modi during an election rally at Jagdalpur, in Bastar district. 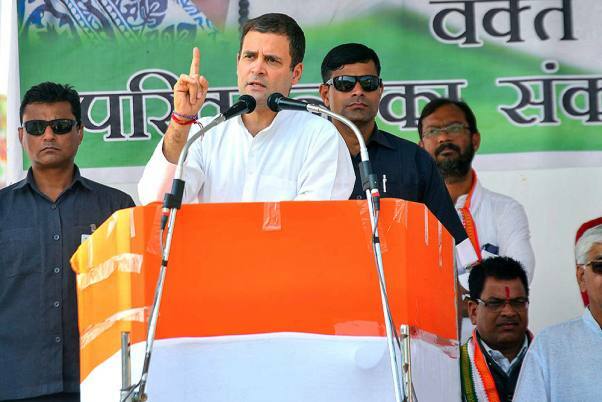 Prime Minister addressed his first election rally in Chhattisgarh, where the first phase polling for the Assembly elections will take place on November 12. 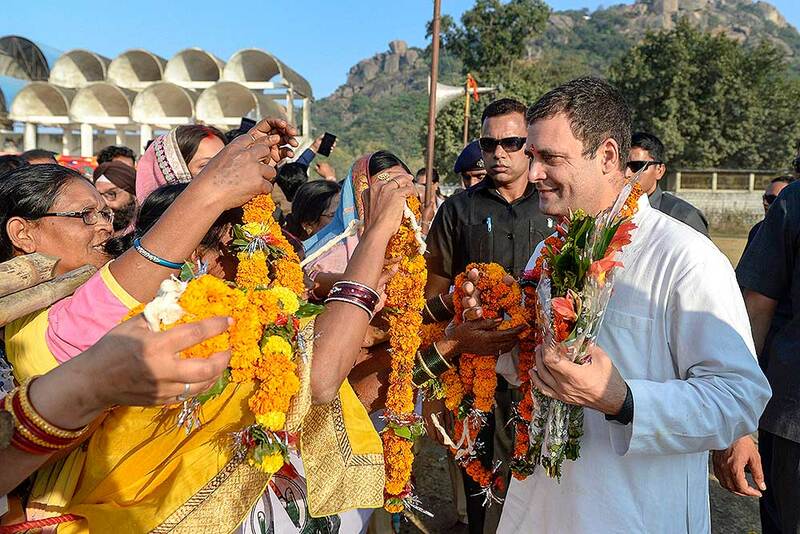 Congress President Rahul Gandhi being garlanded at a rally at Rajnandgaon, Chhattisgarh. 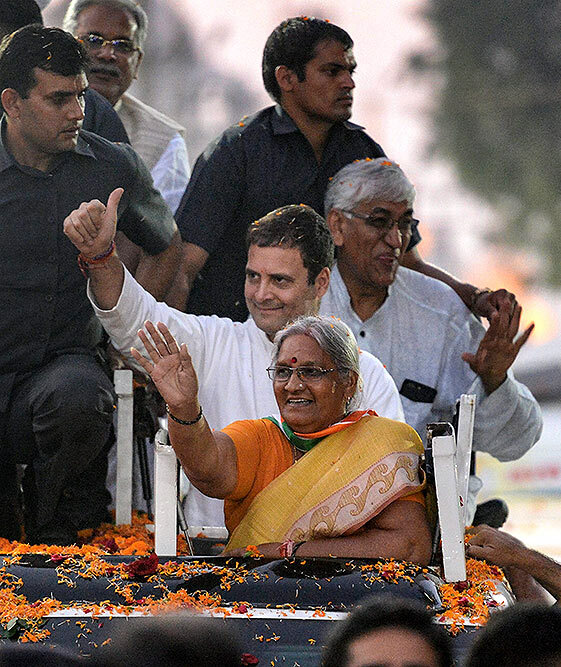 Congress President Rahul Gandhi during a roadshow at Rajnandgaon, Chhattisgarh. 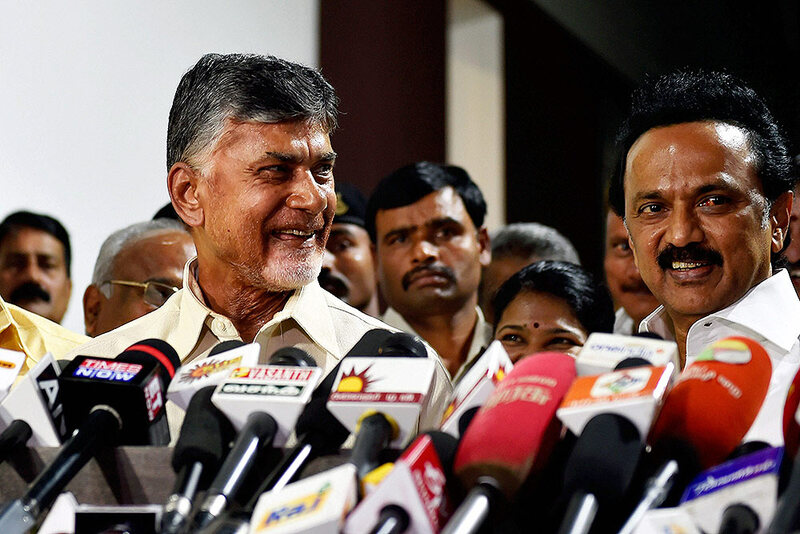 Andhra Pradesh Chief Minister N. Chandrababu Naidu addresses the media with DMK President MK Stalin at latter's residence in Chennai. 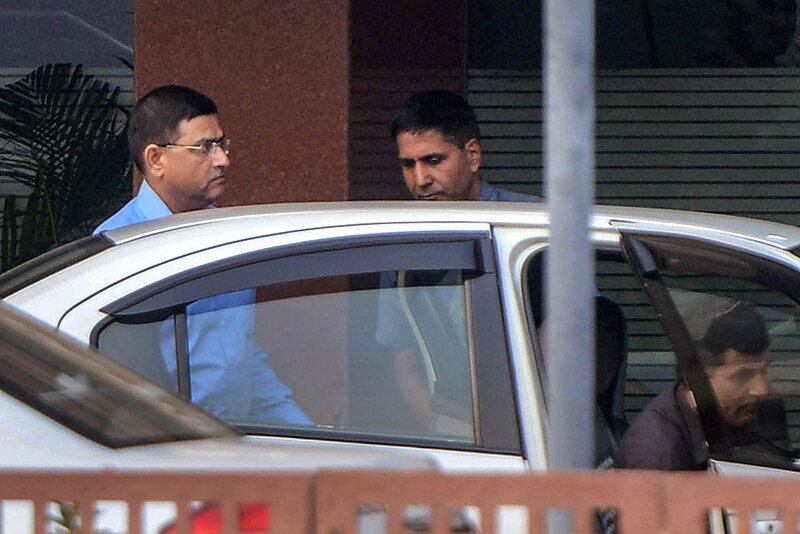 Central Bureau of Investigation (CBI) Special Director Rakesh Asthana at Central Vigilance Commission (CVC) in New Delhi. 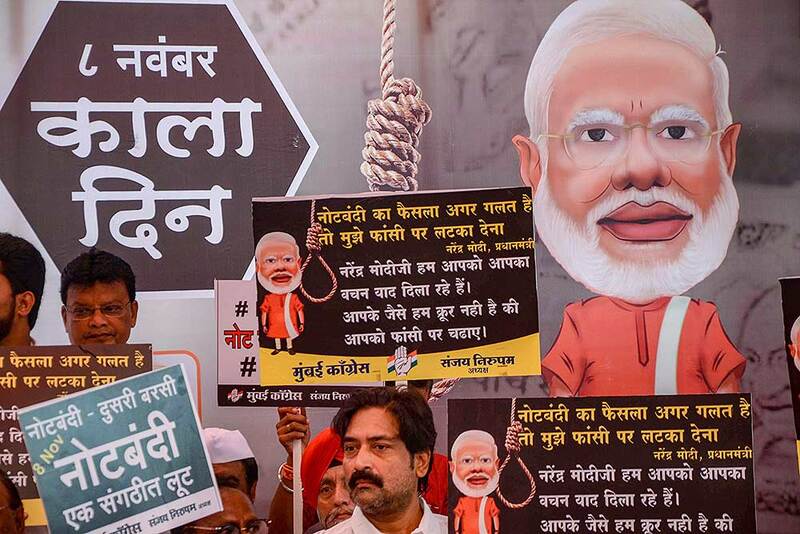 The Supreme Court had on October 26 asked the Central Vigilance Commission to complete within two weeks its inquiry into the allegations against Verma levelled by Asthana. 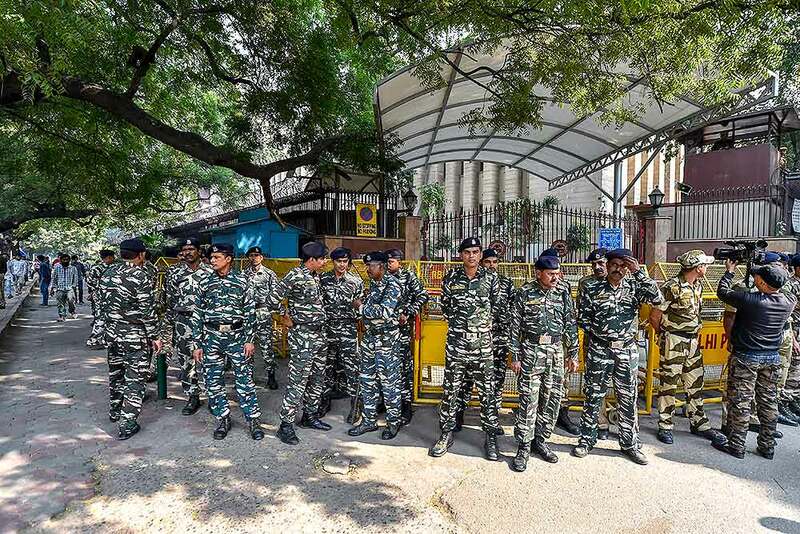 Security deployed outside RBI Headquarters during a Congress Party protest on the 2nd anniversary of demonetisation, in New Delhi. 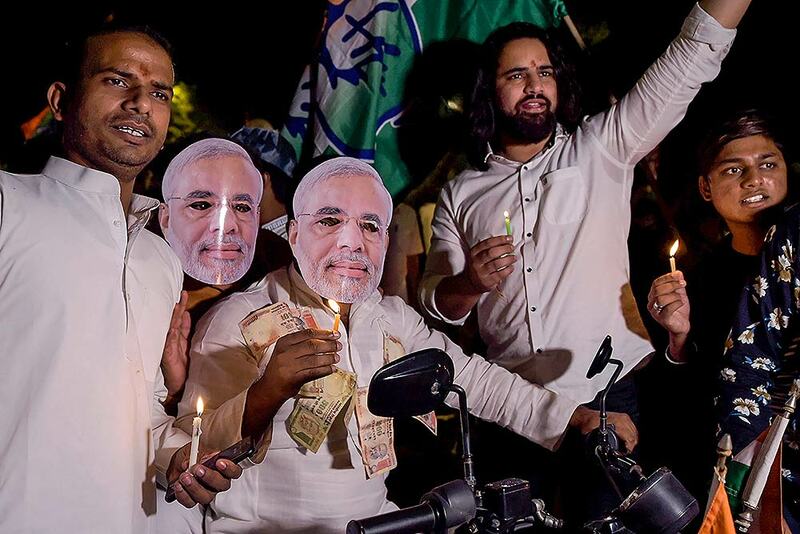 Delhi Pradesh Congress workers take part in a candle march protest on the 2nd anniversary of demonetisation, at Parliament Street in New Delhi. 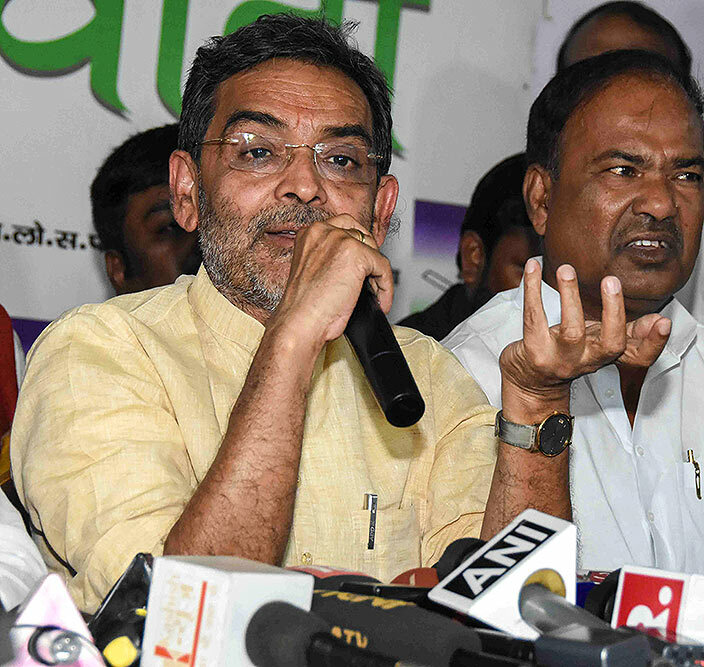 Bihar Rashtriya Lok Samata Party (RLSP) president Upendra Kushwaha addresses a press conference at the Party office, in Patna.